He did not know how to use a dictionary. His father was a class IV dropout and his mother was once completely illiterate. He is one of three children from a family of farmers in Mahiravani, near Nashik. He is the first in his family to have received complete formal education. “My parents were not financially well off, but they were determined to educate us. I originally wanted to become a painter but because I got good grades, I was sent to an engineering college,” he says. Having had schooling in Marathi medium, getting admission to the Government Polytechnic of Ahmednagar was a challenge. He was one among the minority who did not speak English, a factor that prompted some of the other students to leave the course and made him consider the same. “I was on the brink of quitting but I remembered the sacrifices my parents had made to educate me, and I could not let them go waste. When I approached a Professor with my problem, he advised me to get a dictionary. I found it to be a strange word and did not know what to do about it,” he says. Sunil did eventually learn its meaning and procured a dictionary, spending hours making notes and learning new words. . At the end of the year when the results were out, only four out of the sixty students had passed in all the subjects.” I had almost lost all hopes of completing my studies and becoming an engineer, as I was sure I was not one of those four students who had made it. To everyone’s surprise and most importantly my own, I had topped the class! It was at that moment I understood how strongly my success was connected to my friendship with the Dictionary. Sometimes, I feel I must thank God that I came from a non-English medium background, because of which I could realize the difficulties posed by a new language “says Sunil. The achievement led him to think that his friends who had left the course would have stood a better chance, if they also had access to a dictionary. “The dictionary was my friend, and that friendship had helped me to see this day. So I started making photocopies of my dictionary, with all my notes and observations and sharing it, but the reach was limited. I then considered printing it as a booklet but that raised a lot of new costs which I could not bear. This was in 1997, and computers were becoming popular, so I decided a digital dictionary was the way to go,” he reminisces. Recalling his struggle with computers in a bid to learn programming Sunil said “With reference to a paper advertisement, I prepared for the entrance exam of a renowned computer institute. I was qualified too but, I was thrown out because, I had no money to pay their fees. I literally begged them. I told them that I was ready to take up even the sweeper’s job, but they didn’t listen. I took this as a challenge. I left my home, locked myself in a ten square feet room with a borrowed computer & books, and started self-learning. I’d do this for 18-20 hours a day. At one point I had to undergo a surgery because of sitting for long hours. After six months however, I had become familiar with almost all the programming languages. 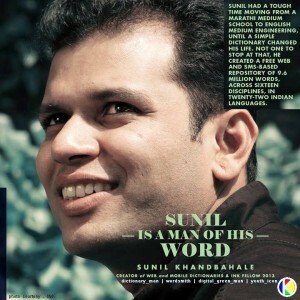 “Sunil finally released an online English-Marathi-English dictionary, the first of its kind. The venture met with much praise and soon Sunil was flooded with requests for more languages, which he promptly obliged, “Though my personal expertise could only be used for Marathi, Hindi and English, I soon reached out to linguists and experts in various fields for help, mostly at universities. When they saw that I wanted to create a linguistic community, they were immediately on board, asking for nothing in return.” he added.